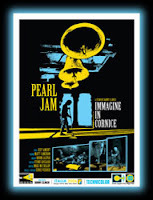 I enjoyed Danny Clinch's rock music documentary (rockumentary, if you want to say it that way) Immagine in Cornice, which focuses on Pearl Jam's short tour of Italy in 2006. Some Ten Club members, like yours truly, received their pre-ordered copy of the film a few days ahead of the September 25th release date. If you didn't have the privilege of watching it before the official release, the movie "drops" (I've never written that before!) this Tuesday. Yesterday, I wrote a review of Immagine in Cornice at the DeRamos.org blog. That review might help in the whether-or-not-to-check-it-out decision-making process, and if it does, I would certainly appreciate a Digg and/or a Del.icio.us bookmark (just click on the bookmark button at the bottom of the post). Thanks! Have You Watched Your Picture in a Frame Yet? Album Art: "Do the Code"
Album Art: "Transcend the Writing"